The Daube has a good article on the long shadow cast by the ghost stations of the alps and focusses on Drouzin le Mont. They also talk about Abondance (saved by an American who then threw in the towel and currently run by the town hall) and St Honore (la Morte) both of which we’ve covered in previous articles. It is a nearly decade since St Honore was bought by a mysterious Savoyard company called La Fourmi (The Ant) for 1.6 million euros. Two of the buildings were done up and the apartments sold. Another building was bought by a notaire. In 2011 the final building got planning permission in 2011 for CP Promotion, a subsidary of La Fourmi but since then, nothing. It seems the curse of St Hughes still blights this community. Noon at the Col du Corbier, the sun hangs lazily above the mountains. A lone snowshoer wanders between lifeless pylons, a local walks her shadow down the deserted street, the warm breeze from the nearby lake Leman whistles through rusting lift cables. Fourteen empty pistes stare across at buildings where ‘For Sale’ signs blossom, closure of the resort has hit rentals from holiday makers who want ski-in, ski-out convenience and is said to have knocked 30-50% of sale prices. Last summer, the “soft” conversion project proposed by the mayor caused a political crisis. Bolstered by fresh elections, local officials hope to negotiate the opening of three drag lifts during the February holiday period but the jewel in the crown, the resort’s chairlifts will be sold for scrap. The 1500 residents of Corbier are more attracted by the slopes of the Portes du Soleil at just 20 minutes by road, there are just seven who have taken a Drouzin season pass in this dormitory resort. Between operating losses, intermittent attendance and an aging fleet of lifts needing expensive maintenance, dozens of stations are in financial difficulty. 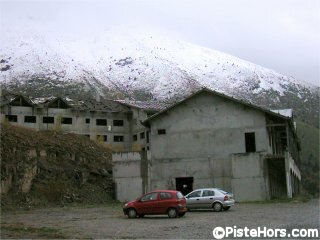 In 2003 the bankruptcy of Saint-Honoré in the Isère was a shock. For a long time local government guaranteed heavy borrowing to support the development of skiing. At the turn of the centry the Isère department made a U-turn, targetting unsustainable sites and offering town halls diversivication contracts. The Chartreuse is a laboratory for these ideas. It is the story of the Original Sin where Mountain communities followed a model supposed to link declining agriculture and dying industry. They were tempted by the mirage of white gold. This autumn, tensions have been running high. In the Bauges Aillon-le-Jeune, the spectre of a closure has provoked an uprising in the population; at Val Mijoux, residents have protested, fearing that the closure of the chairlift will lead to a death spiral in the village. In the Hautes-Alpes, the General Council is concerned by the situation of the Champsaur sites which it funds 50%. Céüse, which has barely operated in the last two years, is being run privately but the future, depending on installing snowmaking on this arid plateau, is in doubt. “We are in the logic of injecting life into an area”, says Laurent Reynaud. “€ 1 spent skiing implies another € 7 in the local economy.” But how much should skiing be supported? There is talk of diversification. “Snowshoeing or dog sledding, but we are doing that already, it won’t replace skiing Drouzin” complains a local businessman. “The end of skiing and nothing else but not the end of skiing,” says Reynaud, annoyed by the “calls to replace skiing with some alternative”. In the Alpes-de-Haute-Provence, the Lure Mountain near Sisteron has kept two of six lifts, reorienting the area towards beginners. In the Drôme the department is building its business model around all four seasons but skiing was never in the tourist DNA of the region. Elsewhere communes are resisting change, sticking with a model that has, for four decades, for better or worse, given a structure to local life.